It’s that time of year again, where more than 700 cheesemakers, distributors, retailers, educators and cheese geeks like me, gather to talk shop, eat cheese, and find out what’s new in the cheese world. This year, we’re in North Carolina at “Cheese Rally in Raleigh”, the theme of the 29th annual American Cheese Society conference and competition. 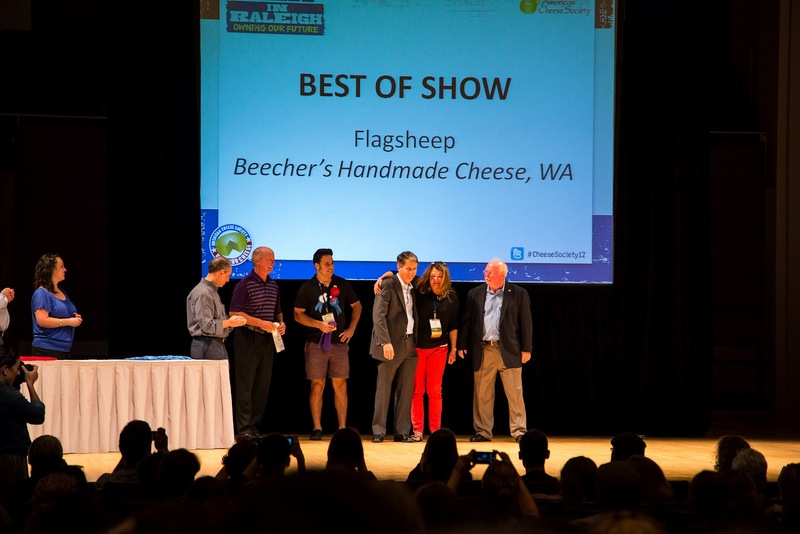 Thursday is my favorite day of the conference, as mid-afternoon brings the Meet the Cheesemaker event, showcasing hundreds of cheeses from dozens of companies across North America. After asking this morning’s keynote speaker Temple Grandin, noted author and expert on humane livestock handling, what her favorite cheese was (answer: blue), I set out to find her at least two new blues, and in the process, discovered a slough of new cheeses I’ll be looking for from now on. First up: two new Gorgonzolas from two Wisconsin companies. Hmmm … is it a bit ironic that I have to travel 950 miles to discover new Wisconsin cheeses? I may be losing my touch. 1. Glacier Gorgonzola Cheese, Carr Valley Cheese in Wisconsin. A few months ago, Carr Valley owner and Master Cheesemaker Sid Cook purchased the old blue cheese factory in Linden, Wis., and renamed it Glacier Point. He’s now making all his blues there, and for the first time, is crafting a cow’s milk Gorgonzola that is to die for. Traditional and well-balanced, this Gorg has just the right amount of salt content and blue veining. Creamy, yet crumbly, it’s got enough bite to make it interesting, but not enough to turn off a blue-veined virgin. 2. Crumbly Gorgonzola, BelGioioso Cheese in Wisconsin. A blend of cow and sheep’s milk, this cheese is crafted in 15-pound wheels. Aged 90 days, it carries a full, earthy flavor and buttery finish that probably comes from the sheep’s milk. You’ll likely find it in 8 oz retail wedges soon in your local store, as it was launched into the retail market just three weeks ago. 3. San Geronimo, Nicasio Valley Cheese Company in California. Biting into this two-month-old stinky washed rind cheese took me back to tasting St. Nectaire Fernier for the first time in the underground aging caves at Jean d’Alos Fromager-Affineur in Bordeaux, France. Creamy, mushroomy and supple, this new cheese from the Lafranchi Family in Marin County is a winner. Marketed as a cross between a Raclette and Fontina, this cheese is more on the order of a farmhouse French cheese. If you find it in a store, buy it all, hide it in your fridge, and don’t share. 4. Alpha Tolman, Jasper Hill Farm in Vermont. Not yet on the market, this washed-rind beauty should hit retail shelves around Christmas. Currently at seven months old, this complex cheese is well on its way to becoming exceptional. Made in 20-pound wheels. 5. Wabash Erie Canal, Canal Junction Farmstead Cheese in Ohio. At 10 months old, this Alpine style, washed-rind cheese is on the order of a traditional Gruyere, and carries notes of a Pleasant Ridge Reserve with an adjunct culture. Brian Schaltter is in his fifth year of cheesemaking, and this year’s ACS conference is his first foray into the national cheese scene. If all his future cheeses are as good as this one, I suspect we’ll see a lot more of him. 6. Glacial Lakes, Saxon Creamery in Wisconsin. This company is going through a bit of transition, having just taken on a new investment partner. Glacial Lakes is the first of what I suspect may be a new line of future cheeses. At only 98 days old, this grass-based, raw-milk cheese cheese is creamy and buttery, with a clean dairy finish. With a little age, this cheese could be a rock star. Jerry Heimerl says he’s hoping to age a few wheels to 7 or 8 months old, which seems like an excellent idea to me. 7. Three Sisters, Nettle Meadow Farm and Cheese Company in New York. This 50-acre dairy and cheesemaking company in the Southern Adirondacks milks 350 goats and 60 dairy sheep. Owners Lorraine Lambiase and Sheila Flanagan craft this delicate bloomy rind cheese, made from a combination of sheep, goat and cow milks. One word: yumolicious. Last but not least, I have to share this amazing marketing piece from the Cellars at Jasper Hill. Packaged like a matchbook, with trading cards inside depicting each individual cheese in its repertoire, this novel little gem is miniature and adorable. Created by Zoe Brickley, sales and marketing manager, the piece replaces brochures that easily become out of date, and if the company adds or drops a cheese, they simply add or subtract a cheese card from the matchbook. Zoe hopes more cheesemakers will adopt the marketing package — and already, Beehive Cheese Company has – to create a series of American cheese trading cards. Genius, sheer genius. It’s cheese week, baby! Yep, this is the one week of the year where I seem normal. That’s because starting today, I am amazingly surrounded by more than a thousand cheese geeks, all of whom this year are trekking from across North America and descending upon Montreal in Quebec, Canada for the American Cheese Society’s 28th Annual Conference & Competition. Held in a different city every year, this is the first time the conference has been held in Canada. However, no matter the location, the faithful few gather each year to talk shop and witness the shock and awe of more than 1,650 artisan, farmstead, and specialty cheeses from Canada, U.S.A., and Mexico. Today and tomorrow, the cheeses are being sorted and judged, and by the end of the week, they will all be sliced and served, giving attendees a rare chance to get an up-close-and-personal look, sniff and taste at thousands of artisanal cheeses, most not available on a national retail level, as they are crafted by small, farmstead and dairy artisans and sold locally. My glorious week of cheese eating actually started a bit early this evening, as dinner in downtown Montreal featured the famous local dish of Poutine. What is Poutine, you ask? Oh, let me tell you. It’s a big bowl of home-made, hand-cut French fries, smothered in rich and smooth beef gravy like your mother used to make, topped by a glorious smattering of fresh cheese curds. Yes, cue the angel chorus. This heavenly dish is then placed in front of you in all its glory, beckoning you to ingest all of its 13,000 calories. Damn I love Canada. Who doesn’t love a country that specializes in a dish combining the three basic food groups – potatoes, gravy and cheese? If the rest of the week goes as well as tonight, this may be the best ACS conference ever. Stay tuned all week, as I’ll be blogging about cheese tours, cheese seminars and of course, the cheese awards ceremony where we’ll learn who takes home the coveted Best in Show trophy. For up-to-the-second news, follow all of us cheese geeks on Twitter by searching the #Cheese Society11 hashtag. Cheese geeks unite!